Alpha-Stim® technology is based on the groundbreaking work of Dr. Daniel L. Kirsch, a visionary who blazed a trail to a much safer model of medicine, based on what the body actually is: a complex series of electrical impulses controlling all physiological functions. Dr. Kirsch discovered that physics controls chemical reactions in the body. This insight pushed his thinking beyond traditional Western medicine, which controls disease using a chemical/mechanical paradigm. Dr. Kirsch’s approach bypasses chemistry, holding that most bodily functions can be normalized electrically. In a series of brilliant intuitive leaps, Dr. Kirsch moved on from acupuncture and began using minute electrical currents, experimenting with electrical waveforms to treat chronic pain. During this time, he realized that he could also use a small electrical current spike to penetrate the skin without needles, allowing the effective use of microcurrents too small to be used previously. He began combining waveforms to activate the body’s natural electrical impulses. Manipulated in precise ways, these waveforms could control not only chronic pain, but also anxiety, depression, and insomnia. 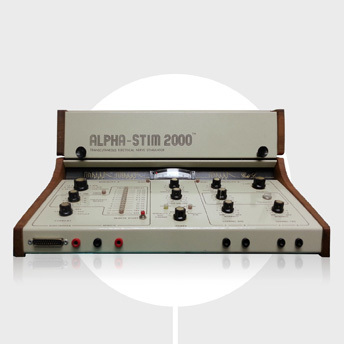 In 1981, Dr. Kirsch’s years of painstaking research and experimentation paid off for medical practitioners and patients worldwide, when he unveiled his perfected waveform technology, featured in the Alpha-Stim 2000, a large clinical pain relief device. Read the article Shocking Medical Devices From Another Century from Wired Magazine. He followed up with the Alpha-Stim 350, the world’s first home care microstimulator. Improvements in microcircuitry eventually led to the 2012 release of the 8th generation Alpha-Stim M and AID pain relief devices, which use the same waveform technology of earlier models, and achieve similarly impressive clinical outcomes for hundreds of thousands of healthcare practitioners and patients around the world—delivering effective acute, chronic, and post-traumatic pain control, and effective management of anxiety, depression, and insomnia. The exact mechanism by which Alpha-Stim produces effects is not fully known. However, based on previous and ongoing studies, it appears that the Alpha-Stim microcurrent waveform activates particular groups of nerve cells that are located at the brainstem. These groups of nerve cells produce the chemicals serotonin and acetylcholine which can affect the chemical activity of nerve cells that are both nearby and at more distant sites in the nervous system. In fact, these cells are situated to control the activity of nerve pathways that run up into the brain and that course down into the spinal cord. 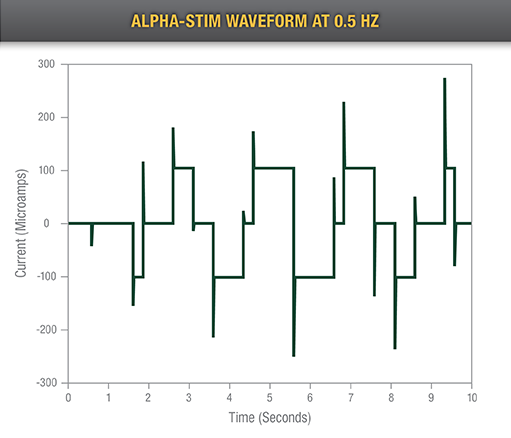 By changing the electrical and chemical activity of certain nerve cells in the brainstem, Alpha-Stim appears to amplify activity in some neurological systems, and diminish activity in others. This neurological ‘fine tuning’ is called modulation, and occurs either as a result of, or together with the production of a certain type of electrical activity pattern in the brain known as an alpha state which can be measured on electroencephalogram (EEG) recordings. Such alpha rhythms are accompanied by feelings of calmness, relaxation, and increased mental focus. The neurological mechanisms that are occurring during the alpha state appear to decrease stress-effects, reduce agitation, stabilize mood, and regulate both sensations and perceptions of particular types of pain. These effects can be produced after a single treatment, and repeated treatments have been shown to increase the relative strength and duration of these effects. In some cases, effects have been stable and permanent, suggesting that the electrical and chemical changes evoked by Alpha-Stim have led to a durable re-tuning back to normal function. EPI is dedicated to continued research into the mechanisms and effects through which Alpha-Stim can be beneficial to patients with pain and insomnia. 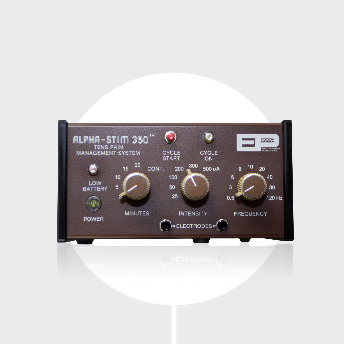 Dr. Daniel Kirsch founded Electromedical Products International (EPI), Inc. Alpha-Stim 2000 was the first Alpha-Stim model produced- a large clinical device for medical practitioners to treat chronic pain. 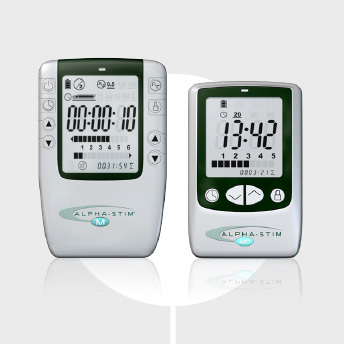 Alpha-Stim 350 was introduced as the first home care microcurrent stimulator for pain relief. 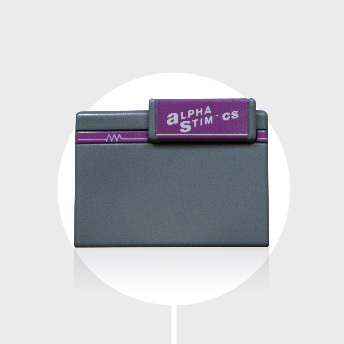 The next generation, and first truly portable home unit, Alpha-Stim CS was launched. 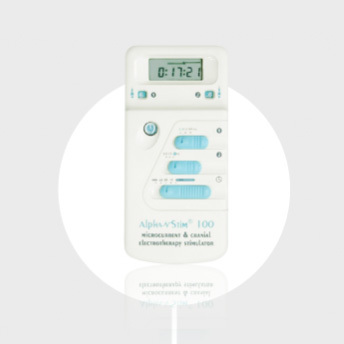 The more streamlined Alpha-Stim 100 became available for both pain and insomnia. 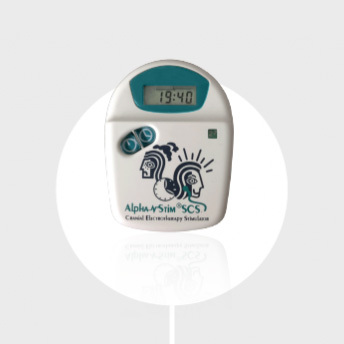 The Alpha-Stim SCS was introduced worldwide to treat insomnia. 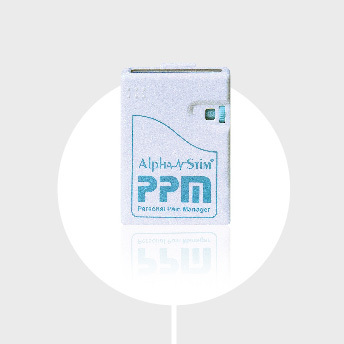 The Alpha-Stim PPM was launched for personal chronic pain managment. The highly effective Alpha-Stim M and Alpha-Stim AID became available and have been helping patients find sustainable relief to this day. Feusner JD, Madsen S, Moody T, et al. Effects of Cranial Electrotherapy Stimulation on resting state brain activity. Brain and Behavior. 2012;1-10. Taylor AG, Anderson JG, Riedel SL, et al. A randomized, controlled double-blind pilot study of the effects of Cranial Electrotherapy Stimulation on activity in brain pain processing regions in individuals with fibromyalgia. Explore. 2013; 9(1):32-40. Kennerly R. Changes in quantitative EEG and low resolution tomography following Cranial Electrotherapy Stimulation. PhD Dissertation, the University of North Texas. 2006; 529 pp., 81 tables, 233 figures, 171 references. Chen Y, Yu L, Zhang J, et al. Results of Cranial Electrotherapy Stimulation to children with mixed anxiety and depressive disorder. Shanghai Archives of Psychiatry. 2007; 19(4):203-05. Lande RG, Gragnani C. Efficacy of Cranial Electrotherapy Stimulation for the treatment of insomnia: A randomized pilot study. Complementary Therapies in Medicine. 2013; 21(1):8-13. Cork RC, Wood P, Ming N, et al. The effect of Cranial Electrotherapy Stimulation (CES) on pain associated with fibromyalgia. The Internet Journal of Anesthesiology. 2004; 8(2). Rintala DH, Tan G, Willson P, et al. Feasibility of using Cranial Electrotherapy Stimulation for pain in persons with parkinson’s disease. Parkinson’s Disease. 2010; 8 pages. Barclay TH, Barclay RD. A clinical trial of Cranial Electrotherapy Stimulation for anxiety and comorbid depression. Journal of Affective Disorders. 2014; 164:171-77. Mellen RR, Mackey W. Reducing sheriff’s officer’s symptoms of depression using Cranial Electrotherapy Stimulation (CES): A control experitmental study. The Correctional Psychologist. 2009; 41(1):9-15. Winick RL. Cranial Electrotherapy Stimulation (CES): A safe and effective low cost means of anxiety control in a dental practice. General Dentistry. 1999; 47(1):50-55. Kolesos On, Osionwo Ho, Akkhigbe. The role of relaxation therapy and Cranial Electrotherapy Stimulation in the management of dental anxiety in Nigeria. ISOR Journal of Dental and Medical Sciences. 2013; 10(4):51-57. Kennerly R. Changes in quantitative EEG and low resolution tomography following cranial electrotherapy stimulation. PhD Dissertation, the University of North Texas. 2006;529 pp., 81 tables, 233 figures, 171 references. Abbreviations: ACh: actetylcholine; LDT: laterodorsal tegmental nucleus of the brainstem; PPN: pediculo-ponitne nucleus of the brainstem; NE: norepinephrine; LC: locus ceruleus, 5-HT: serotonin. NOTE: Diagram not to scale. 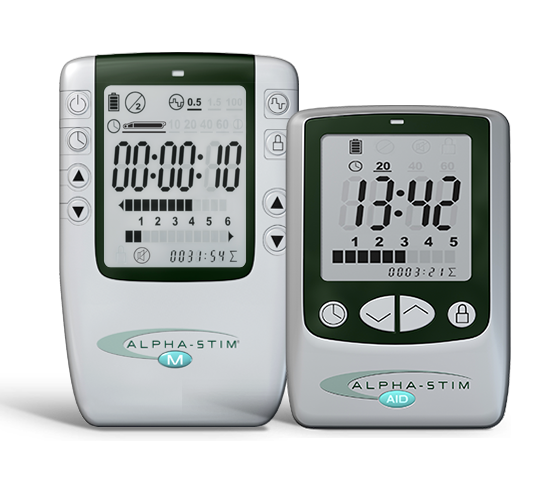 Official Canadian Distributor of Alpha-Stim®. © 2019 Natural Pain Products Inc. All Rights Reserved.